GROSSETO, Italy The captain of the cruise ship that crashed into an Italian reef appeared in court Monday to hear the evidence against him, while hundreds of passengers who survived the deadly shipwreck and the families of those who died in it showed up just "to look him in the eye." The case of Francesco Schettino, 51, was of such enormous interest that a theater had to be turned into a courtroom in the Tuscan city of Grosseto to accommodate all those who had a legitimate claim to be at the closed-door hearing. Wearing dark glasses and a suit, Schettino used a back entrance to slip into the theater, making no comment to reporters outside. Lawyers said he listened intently to the proceedings inside, where his attorneys raised some objections to the evidence being submitted. Thirty-two people died after Schettino, in a stunt, took his Costa Concordia cruise ship off course and brought it close to the Tuscan island of Giglio on the night of Jan 13. The ship ran aground and capsized. Schettino then became a lightning rod for international distain for having left the ship before everyone was evacuated. Hearings this week will help decide whether the judge will order a trial for Schettino, who is accused of manslaughter, causing the shipwreck and abandoning ship while passengers and crew were still aboard. He denies the accusations and hasn't been charged. Any trial is unlikely to begin before next year. More than 1,000 survivors, victims' relatives and their lawyers attended the hearing on the evidence against Schettino and eight others accused in the shipwreck, including crew members and officials from Concordia owner Costa Crociere SpA. "We want to look him in the eye to see how he will react to the accusations," said German survivor Michael Liessen, 50, who attended Monday's hearing along with his wife. 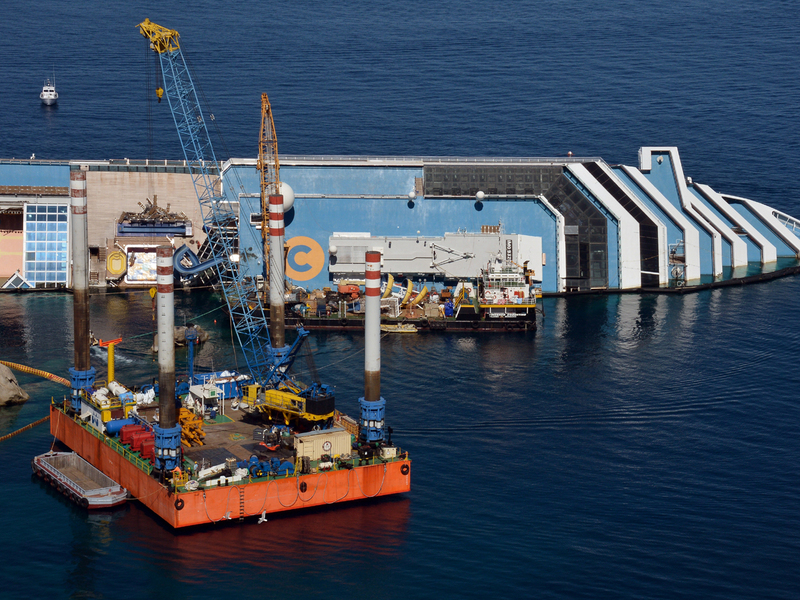 More than 100 lawyers representing survivors and the families of the passengers and crew who died in the Costa Concordia have shown up for the hearing in Grosseto, said CBS News correspondent Allen Pizzey. Their target is not the captain, but the American owners of the cruise line. Peter Ronai's 10 clients are asking for $200 million. Ronai said, "What we want to make very clear here is that this accident was not the cause of the collision. The accident was caused by an avalanche of negligence." This week's proceedings are based on evidence from the ship's black box recordings. Documents before the court run to 270 pages, including navigational details and conversations on the bridge of the Costa Concordia, reports Pizzey. Among those who died was a Hungarian violinist who, survivors recounted, gave his life vest to a child before perishing himself. Peter Ronai is representing his family. "The reason people died was not the captain" alone, Ronai told reporters before entering the hearing. "There was no reason for anyone to die." "This ship was as big as a shopping mall. There was absolute chaos," Ronai said. Costa Crociere has denied that it was negligent and has distanced itself from Schettino, firing him in July, although he is fighting to get his job back. Passengers described a confused and delayed evacuation, with many of the lifeboats stuck and unable to be lowered because the boat was listing too far to one side. Some of the 4,200 people aboard jumped into the Mediterranean and swam to Giglio, while others had to be plucked from the ship by rescue helicopters hours after the collision. Schettino has insisted that by guiding the stricken ship into shallower waters near Giglio's port instead of immediately ordering an evacuation he potentially saved lives. He has claimed that another official, not he, was at the helm when the ship struck. The timeline in the experts' report, however, makes clear that he had assumed command six minutes before the ship struck the reef. An American lawyer representing more than 150 people in U.S.-based lawsuits against Carnival Corp. said he came from Mississippi to closely follow evidence that could be useful in his cases. Aside from financial compensation for his clients, John Arthur Eaves Jr. said he is pushing for improved standards in the cruise industry. A $300 million salvage operation is underway to pull the liner off the rocks where it is lodged. The chunk of the reef the ship hit has now been removed from the hull. It weighed in at 95 tons. Once the hulk is re-floated, it will be towed away and almost certainly scrapped.